A healthy and sound liver function is extremely important for bodybuilding and for a happy life in general. Using supplements and prohormones can sometimes badly affect your liver. You may also want to cleanse your liver due to some disease or you may have dietary restrictions. Anyway, a healthy liver is crucial for blood and body cleansing. Consequently, supporting the liver with some supplement is right what you need. Introducing Hi-Tech Pharmaceuticals Liver-Rx 90 Tabs! Where to buy “Liver-Rx” ? What does Hi-Tech Liver-Rx contain? How Do I Take Liver-Rx? 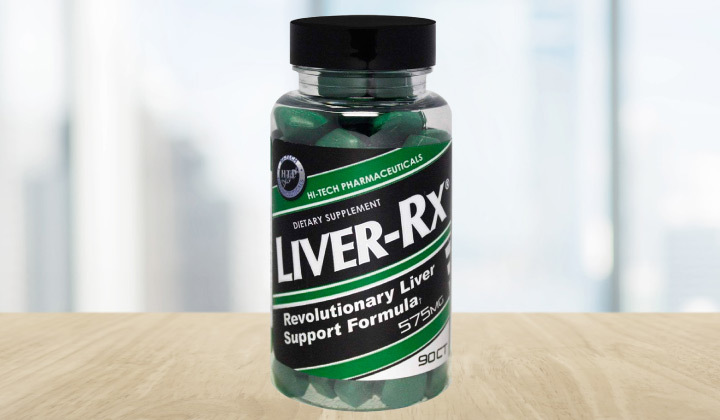 A supplement called Liver-Rx, manufactured by Hi-Tech Pharmaceuticals, has a revolutionary liver support formula which protects it, cleanses it, and helps liver cells rejuvenate. The supplement includes 6 natural compounds working together to protect the liver. Milk Thistle and NAC are among them. This Hi-Tech supplement is perfectly suitable to take after your cycle or in case you are going to cleanse your liver. Liver Rx contains 6 main extracts helping each other to ensure the most perfect liver function for your body. Whatever the reason – prohormones or alcohol – Liver-Rx from Hi-Tech will most certainly help you. Each pill contains about 575 mg of powerful Lipotropic extracts helping your body cleanse and rejuvenate the liver. Milk Thistle, ALA, NAC, Schisandra, Picrorhiza Kurroa, and Glycyrrhizin are those 6 extracts. Silymarin or Milk Thistle is a plant which shows its powerful capabilities to protect liver cells. The extract acts as an antioxidant cleansing the liver and boosting protein synthesis which stimulates cell rejuvenation processes at the same time. NAC or N-Acetylcysteine is an amino acid helping your body to restore glutathione levels. When you overload your liver, the glutathione levels get low, and that is the reason why your liver malfunctions. Consuming the compound, you will essentially detoxify your liver! ALA or Alpha Lipoic Acid is an antioxidant increasing the production of other antioxidants in your body, namely Vitamin C and Glutathione, and they, in their turn, restore healthy liver function. Picrorhiza Kurroa is actually an amazing herb helping your body to produce oxygen, supply it to your liver, and keep it clean. Schisandra Chinensis is a plant widely used in Chinese traditional medical practices to protect the liver from toxins. It also efficiently fights viral diseases. We recommend you to take three tablets daily. Never exceed 9 tablets per day.